Soufflés have something of a reputation for being a little on the tricky side. If any of the Master Chef contestants ever say they’re going to bake a souffle, there’s always a sharp intake of breath and concerned expressions. But really, they’re not all that hard to do. Admittedly this was only the second time I’ve ever attempted them but both times they’ve been a great success. So you see, if I can make them, anyone can. I used a lovely local Cheddar cheese in these soufflés. Dan Holland who owns the Queen Street Deli in Wells recommended Montgomery Cheddar, which is handmade on Manor Farm in North Cadbury. 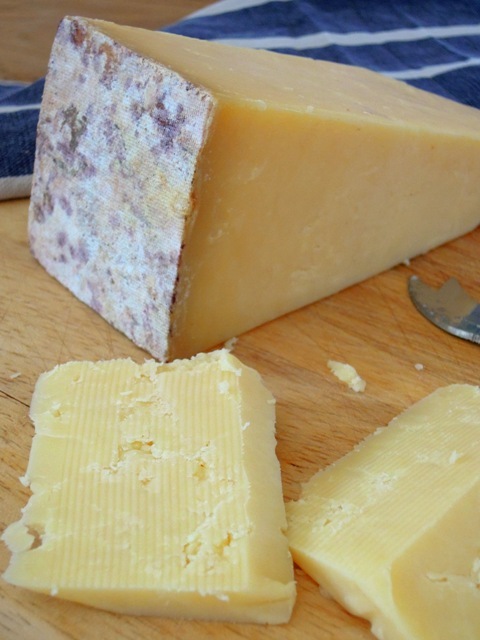 It’s a traditional, unpasteurised Somerset Cheddar, matured for 12 months to give it a gorgeously deep, nutty flavour. 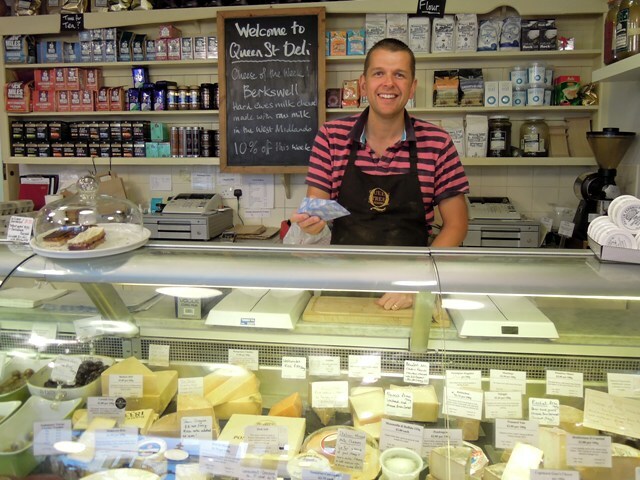 The Queen Street Deli is another local business taking part in the Wells Food Festival on Sunday 20 October. Dan is organising the cheese stand at the festival, which will highlight the fantastic wealth of Somerset cheeses we are lucky enough to have on our doorstep. During the day, local cheese makers will take turns on the stall to share their knowledge and passion with visitors. Dan is also selecting and sourcing the cheese for the Somerset Sunday Lunch in the town hall, which he describes as a great honour and a chance to showcase a few of his favourite and most popular cheeses. The Queen Street Deli is a small friendly shop, offering the best of local and continental food. Dan opened it in 2008 when he decide to leave teaching maths at the local school and went for a complete career change, working with food – something that had been a bit of a dream for a while. I asked Dan what he thought this first Wells Food Festival means for the food and drink of Somerset. So what are Dan’s personal favourites when it comes to Somerset’s food and drink? “Obviously I have a slight bias towards cheese,” Dan replies. “We have some great Cheddars such from the likes of Barbers, Keens and Montgomery but I still think Westcombe is my fave. I also really love the range of cheese produced by the Somerset Cheese Company in Ditcheat. Their Rainbows Gold is very popular in the deli at the moment; rich curd made with Channel Island cows milk then washed in Golden Chalice ale from Glastonbury. Armed with a decent chunk of Montgomery Cheddar, I returned home all inspired to bake my soufflés to hopefully celebrate a true taste of Somerset. The recipe is based on one I found in Mary Berry’s New Aga Cookbook for Swiss Double Soufflés, substituting her Gruyère for the Cheddar. It’s a perfect dish to cook in the Aga, but don’t worry – instructions for conventional ovens are also included below. As the name says, these soufflés are double baked: first in ramekins in a bain-marie, and then again in a the cream sauce. So it’s no great disaster if your soufflés flop a little, as the double baking means they won’t end up all puffed up anyway. But they still taste beautifully light and airy, albeit rather rich and luxurious at the same time. 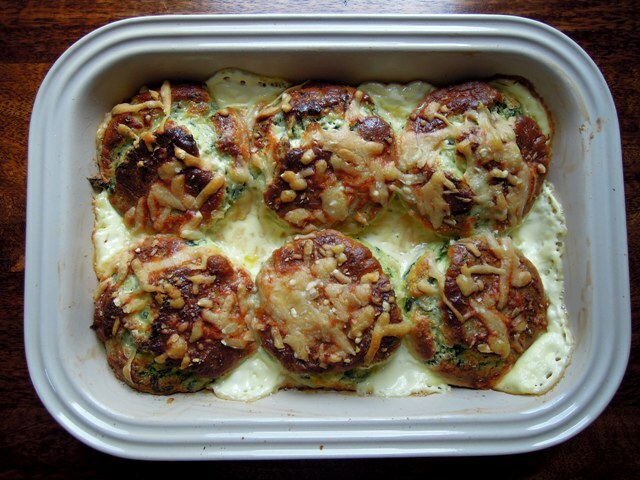 They made for the perfect Saturday lunch, served with crusty bread and a simple salad, and they went down well with the children too – despite them containing spinach, which is not Mia’s favourite vegetable. If you’re using a conventional oven, preheat to 220°C/gas mark 7. Place the spinach and milk in a pan and bring to the boil. Stir well, remove from the heat and leave to one side. Melt the butter in a large pan. Remove from the heat and stir in the flour. Return to the heat and cook for a minute, stirring constantly. Add the spinach and milk, a bit at a time, and bring to a gentle boil, stirring all the time. Simmer to thicken the sauce. Remove from the heat and mix in the salt, pepper, a good grating of nutmeg, and Cheddar cheese. Once these are well mixed in, stir in the egg yolks. In a large clean bowl, whisk the egg whites until stiff and then carefully fold into the sauce. Generously butter six small ramekins and spoon in the souffle mixture. Place them in a small roasting tin and pour boiling water into the tin until it is halfway up the sides of the ramekins. If you’re cooking in an Aga, place the bain-marie in the roasting oven on the grid shelf on the oven floor for 15-20 minutes. After 10 minutes of the cooking time, when the soufflés are a good golden brown colour, turn the tin around and slide in the cold plain shelf on the second set of runners. Cook until they are springy to the touch. If you’re cooking in a conventional oven, simply place the bain-marie in the oven for 15-20 minutes and cook the soufflés until golden and are springy to the touch. Remove from the oven and leave for 5-10 minutes in the ramekins to allow the soufflés to shrink back a little. Butter a shallow ovenproof dish which is just big enough to take the soufflés without them touching. Sprinkle half the grated Cheddar onto the bottom of the dish. Carefully remove the soufflés from the ramekins using a small palette knife and place in the ovenproof dish. Season the cream and pour over the soufflés. Sprinkle the remaining Cheddar on top and bake in the roasting oven if you’re using an Aga, this time without the cold plain shelf, or in your regular oven, for 15-20 minutes until the soufflés are golden brown. As these double baked soufflés are not to be rushed and are best made when you have some time on your hands, they definitely fit the bill as a Weekend Slowie, which is the theme this month for the Family Foodies challenge over at Eat Your Veg. So here you are, Lou – hope you like them! Lovely post and recipe Vanesther, and a fab series on local Well Foodies. 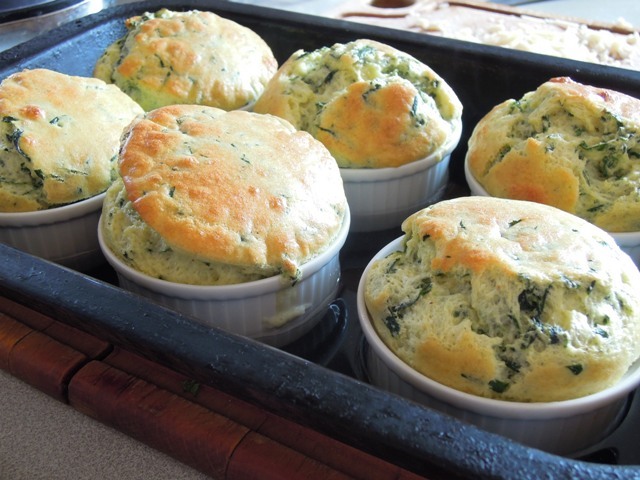 Your soufflés look mightily impressive, says the gal who’s never actually attempted one. Could happily scoff down the lot now! Still chuckling to myself that in my early morning bleary eyed state I managed to read ( and re-read several times) Mary Berry’s book to be The New AGE Cookbook. Mary Berry, New Age, I really don’t think so! Oh and another fab entry to #FamilyFoodies btw. Love the cheese shop and really want to make your souffles. 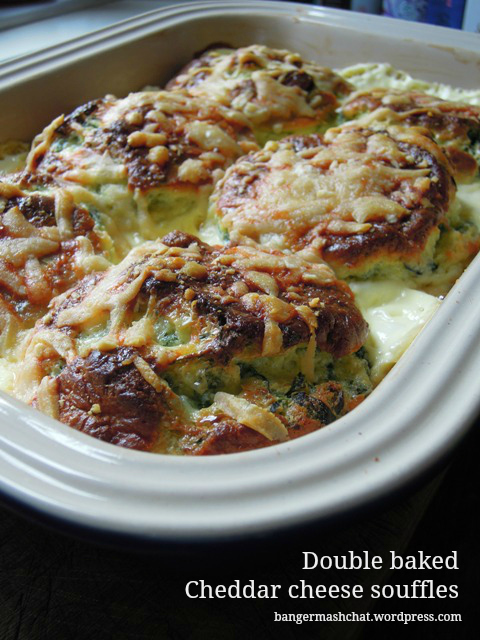 They look yummy and what a great way of sneaking the spinach in. Thanks Andrea. My youngest has real issues with anything too green and leafy, so this was a perfect way to sneak some in. Spinach smoothies are fab too! Those souffles look fabulous, I’ve only made them twice before and you’re right they’re not that tricky to bake, just need to pay attention a little bit! Shame I don’t live in Somerset anymore as it looks like the food festival is going to be a good one. I used to live about half an hour away from Wells as a teen and always enjoyed wandering around the independent shops. Thanks Jen. You’re so right – they do need a bit of attention but are nowhere near as tricky as you might think. Beautiful soufflés! And they sound delicious as well as I absolutely love soufflé! I’ve done both blue cheese ANC chocolate and was thrilled when my teenage nephew came to visit and asked me to teach him to make soufflé. We had a great time! They are a unique challenge but very doable and very worth the effort. Wonderful post. Thanks Danielle – I haven’t tried making a chocolate souffle yet but with a little chocoholic in the house, I think they’d be rather appreciated! These look AMAZING! I miss cheddar so much! Italy has some great cheeses but for me nothing beats a good mature cheddar!